As the holiday seasons approach us the ever looming question is asked, "What do you want for Christmas?" Well if you any normal person the answer might be a new pair of socks, underwear, or that sweet Coneheads t-shirt you found at Target. But if you are a woodworker then the list is never ending and can sometimes be a daunting task for that shopper in your life. They may be asking themselves. "There is so much that a woodworker wants or could use. Where do I start?" Well the good news is you can find a ton of articles about holiday lists from other woodworkers/ content creators. But what if you do not have that $150 to spend on that sweet new Kreg K5 Pocket Hole Jig? 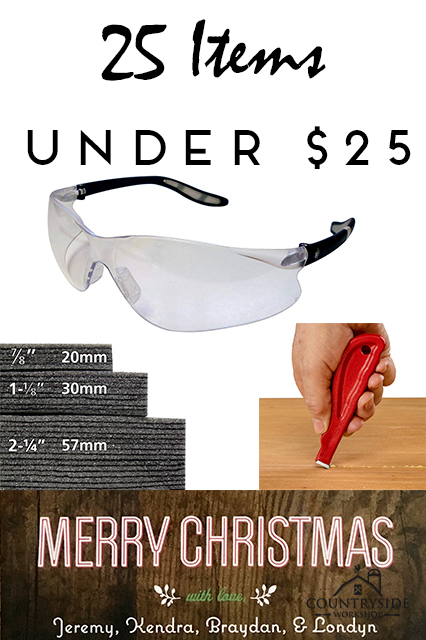 Well here is a list of 25 items that are all under $25 that every woodworker can use. 1) Sandpaper: Assorted grits from 120-600 is what I find is the most useful. The most used in my shop is 220, 320, & 600. But hey I break the rules all the time and skip grits (some woodworkers will tell you that is a no no). 2) Contour Sanding Pads: These are good to sand in all those curves that your woodworker cuts on all those fancy tools he/she owns. Plus, why not? You just bought them a ton of sandpaper. 3) Wood Glue: Another thing that is a must in all shops and usually runs out when we need it the most is quality wood glue. My go to glue is Titebond II or if I am building something that will be exposed to a lot of moisture then I will use Titebond III. 4) Glue Brushes: I have seen a ton of ways to spread glue from old credit cards, paint rollers, acid brushes, even a finger. But once I got these silicone brushes I never use anything else for my wood glue. The glue just peels right off after it dries. 5) Safety Glasses: You want your favorite woodworker to be safe don't you? Well make sure they have plenty of safety glasses to keep those eyes protected. 6) Hearing Protection: I can never find my hearing protection when I need it the most. So why not have several pairs laying around. Plus if you ask my wife I cannot afford to loose anymore hearing. 7) Blue Shop Towels: I find that I use these on every project. I like them the best because they are cheap enough that I don't start crying when I throw them out after I use them but they are tough enough to stand up to most all my tasks. Dang, I need more of these! 8) Bench Cookies: If your woodworker has been in the game long enough then they have had the need to elevate their work for sanding, routing, or something else. In my experience when I need to raise my work up I have to reach for scrap wood and I never have enough pieces that are the same thickness. This can be problematic when you are trying to get things precise. A set of at least 4 bench cookies can solve that problem. 9) Pencil Sharpener: Most woodworkers prefer a nice #2 pencil for their work. I prefer a .05 mechanical pencil but like I said earlier... I like to break some of the rules. I do use a white pencil that needs to be sharpened and my kids need a sharpener for their homework, so why not have this in the shop. 10) White Pencils: Most woods do not show lead based pencils very well. I prefer a white pencil so I can easily see my markings. But most "Color Pencils" that are used for art will not work or do not show up. It has to be something like a grease pencil. The Stabilo-All Pencil White is best one I have found and it works on most anything, yes it even works on glass. 11) Bessey Clamps: Ever hear the saying, "You can never have too many clamps?" Well your woodworker has and he/she will love you for getting them more. My go to clamps are the Bessey F-Style Clamps because they are durable and offer great pressure for keeping this joints together. 12) Arm-R-Seal: What can I say I am a little biased when it comes to my finishes and if I am using an oil based finish/top coat then I am using the General Finishes Arm-R-Seal. It is easy to work with and looks beautiful when dried. 13) Foam Brushes: I like foam brushes to apply my stain and my initial coats of finish. These are cheap enough that I can just throw away when I am done and I don't have to worry about washing them out. 14) FastCap Tape Measures: Tape Measures are a necessity for any woodworker. But if they are OCD like me then they want quality and repeatability. FastCap make several versions of their tape measures and they all give me the same repeatability that is paramount to a woodworker. Plus, I have more than one tape measure in the shop and they all have to be the same. 15) Card Scraper: Sanding seems to be the most hated task by many woodworkers and it creates a lot of fine dust particles that can be problematic for our bodies over an extended period of time. I prefer to scraper my wood to get it smooth. That way when I do need to go to the sander I don't have to go through all the grits. 16) Kaizen Foam: Can you say OCD? Well my wife says I have it bad and self admitting "I DO". Kaizen Foam from FastCap is awesome when it comes to shop organization. I use this stuff all over my shop and in all my drawers to keep a consistent look. It is super easy to just trace, cut, and peel layers of foam out to get that perfect fit for that odd shaped tool. 17) Nitrile Gloves: Gloves seem to be the biggest disposible item in the shop. I use 2-3 pairs on every project I build because I use them when I am finishing my pieces. This keeps harmful chemicals off my hands and out of my system (hopefully making me a little healthier). 18) Woodpeckers Mini Scraper: When it comes to glue squeeze out nothing can be more of a pain to get rid of. I mean if you wait too long then it will rip the wood fibers when getting the squeeze out off. If you don't wait long enough then you just smear the glue around. With this scraper in their tool arsenal they should be able to cut right through that squeeze out. 19) Mini Kreg Pocket Hole Jig: When making face frames or cabinets pocket holes are one of the quickest and easiest methods. But what if they don't build cabinets... pocket holes are a good fast alternative to join pieces off wood, especially if they need to disassemble it at all. 20) Kreg Face Clamp: If you have the Kreg Pocket Hole Jig then having their clamp is a must (not really) but it sure makes assembly easy. It keeps the two pieces clamped together and flush with each other. 21) Kreg Screws 675pcs: Screws you say? Well if you have the jig and the clamp then why not buy the screws? Having an assortment of screws on hand will save that woodworker in your life the pain and time from running to the store when they run out or don't have the size they need. 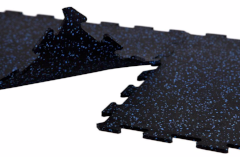 22) 8mm Strong Rubber Tiles: Standing all day on a concrete floor can be killer on the knees, legs, and back. These rubber tiles are awesome and provide just the right amount of cushion to keep my body from killing me. Bonus is they provide protection for their tools in case they drop them. That sharp edge they spent a lot of time perfecting will not get chipped. 23) Strop: Speaking of sharp edges. If they spent a long time getting that chisel or plane iron nice and sharp then they want it to stay that way. Well a strop is a quick way to keep that edge nice and sharp. 24) Honing Compound: If they are going to have a strop in the shop, haha that sounds funny, then they need the honing compound for it as well. This provides the right amount of lubricant and polishing agent to make those tools shine. 25) Flush Cut Saw: Lasting, a flush cut saw makes things really easy. This little saw allows them to cut a piece of wood flush with the surface of something. This saves a lot of time in trying to sand it smooth. 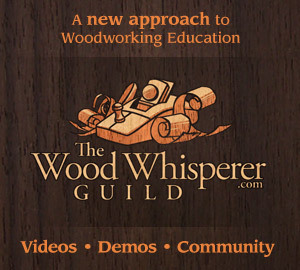 Bonus: Woodworking Books: A bonus entry for them... get them a great woodworking book. If you visit the books section of my website you will see a list of books I own and recommend. Several of them are from good friends of mine and they provide a valuable outlook in woodworking. Stay Safe and Happy Holidays from all of us here at Countryside Workshop! As the holiday seasons approach us the ever looming question is asked, "What do you want for Christmas?" Well if you any normal person the answer might be a new pair of socks, underwear, or that sweet Coneheads t-shirt you found at Target. Every year Marc & Nicole Spagnuolo, The Wood Whisperer, put on an annual charity event that raises money for various charity foundations. Woodworkers Fighting Cancer was started in 2010 and has evolved since then. When May/June rolls around as a kid I thought about Summer and all the things I wanted to do to stay out of trouble (ok, ok you caught me; I did my fair share of stupid things that got me in trouble). It's that time of the year, Mother's Day has come & gone and now we are starting to think about the father figures in our lives. In case you were sleeping under a rock the last weekend, the Atlanta Woodworking Show just wrapped up.